You know, it is always encouraging when you begin walking through a farmer’s field and the first thing you see is their hands in the ground, holding what they have worked so hard to create, something they are proud of, it is the foundation of life on their farm: the soil. This description does not stray far from Nelson Castrillo, the owner of Granja Piedra Pintada, a diversified farm outside of El Bolsón, Argentina that focuses on organic frambuesas or as we call them in English, raspberries. Nelson grew up with the ethic that there was no other way but organic, and sticks to these principals to this day. He believes that all aspects of the farm are connected to the soil, and with a keen eye, timely testing, and a deep cultural and scientific understanding of chemical balance has helped to create one of the healthiest loams I have ever seen. The various systems of his farm such as alfalfa, wheat, hogs, and fruit trees all go to support his main enterprise the organic frambuesas, and after a visit, some Spanish, and a walk through an unbelievable raspberry field, I had a better understanding of fruit production and the life of a truly organic farmer in South America. We had a long discussion with Nelson in his kitchen over a cup of coffee. It quickly became evident that he was a very intelligent farmer. He understood, in depth, the organic issues of Argentina, and though not certified, ran a truly diversified farm that avoided synthetic chemicals, even those labeled “organic”. It is refreshing when you hear an organic farmer speak of holistic management and systems. We need more organic farmers that understand systems, because I don’t know about you, but I’m getting tired of walking through Eco Ag trade shows and half of the booths are some “new” “all organic” chemical that I can add to my farm to “solve the problems I’m to lazy to think about and solve through creativity and good management.” Now don’t get me wrong, the responsible and timely application of certain products when they are needed, can save a farm; but, lets not go over board and jump back into the pool of classic, Cartesian, reductionism, that has no doubt been a predominant force in the rapid decay of agricultural land around the world over the past 100 hundred years. Digression aside, Nelson understood systems, and when we walked into his frambuesa field, the health and abundance of the fruit made this all very clear. Perfectly aligned rows, immaculately organized layout, and a glowing picturesque backdrop of el Piedra Pintada, or the painted rock, greeted me as I walked through the trees. 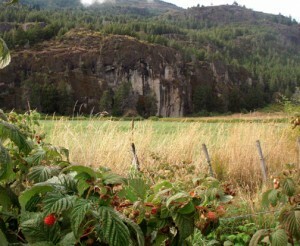 “Large rocks are good for raspberries when they are close buy, “ Nelson said.” The rock radiates heat in this small valley and helps to create a microclimate.” By looking at the fruit and its prevalence on every bush, in a region that can expect a frost eleven months out of the year, it became clear that he understood this system. Not only does the rock play a roll in creating the microclimate, but also the surrounding trees, and the resilience and health of his soil do as well. 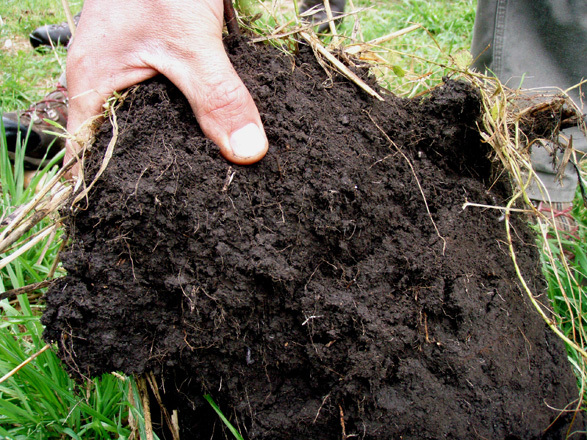 As a living soil respires, it gives off energy in the form of heat. This microclimate is one key factor in the success of the frambuesas, and though the painted rock helps, Nelson believes that the soil is still the center of the equation. The soil in this region is traditionally very good, with very high organic matter content, but the land that became his frambuesa field had historically been abused through trigo or wheat production, and only consisted of 4 percent organic matter. This is actually a fairly high percentage of organic matter for the majority of the planet; however, for this region it is not, and through good management, Nelson has created a well-drained soil, loaded with earthworms, that consists of 8 percent organic matter on average! So how exactly does he feed his soil? The farm is approximately 8 hectares or 20 acres, and the frambuesas only occupy around a quarter of the total property, with the remaining land consisting of trees and alfalfa pastures, occasionally rotated with wheat to help break pest cycles such as the alfalfa weevil. The main use for the alfalfa and wheat is export. But don’t get me wrong, Nelson believes in growing food in Zonas or as we call it in the U.S. “Local”. His alfalfa just travels a short bit down the road to another farm that focuses on composting. In exchange for his all-organic, nutrient rich carbon, he receives enough compost annually to fertilize his frambuesas and improve soil quality. This is a great example of community agriculture and the power of trading. We should be networking with our neighbors, building strong relationships, and keeping the well being of everyone at the center of our priority list. The coal does not burn long far from the fire, and a farm with no community is doomed. This is an underlying ethic at Piedra Pintada and you can see it clearly in the success of the farm as well as the other farms in the area. As we continued our walk around, Nelson constantly put his shovelhead in the ground to turn over a new piece of earth, only to carefully return the clump of soil to where it came. The soil here, again, is the centerpiece of life and he is constantly thinking of creative ways to eliminate synthetic inputs. Including his primary fertilization method which consists of: 130 liters of water, 1 liter of milk, 1 liter of sugar, and 4 kilograms of compost to provide micronutrients and bacteria. This is a very similar concoction to what Gil Carandang, the Philippine farmer and scientist discussed on in the recently posted news article from the Rodale institute. 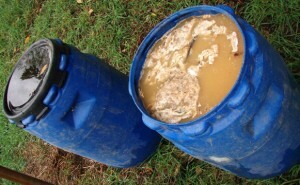 This ripe smelling concoction ferments along side his field in a large barrel and is then sprayed, in a traditional backpack sprayer, at the foot of every row. Not only are frambuesas growing in the rows, but also many other plants such as clover, plantain, and native grasses. There is not a barren piece of soil anywhere. It is this diversity that helps his frambuesas actualize their full potential. As other ecological studies have indicated, when plants are growing in a community every plant thrives, contains a little more biomass, and in the long run appears healthier than when grown in a monocrop. Wow, biodiversity, community, companionship? What a concept. I believe this lesson transcends the agriculture plain, and should be screamed from the hilltops. Granja Piedra Pintada, like many other Eco Farms, are doing just that, spreading the message of life and health for the planet through their actions. In such a short time, we had learned so much, including a few other useful techniques for soil-health, and robust frambuesas. Integrated Pest Management and crop rotation are integral parts of any Eco Farm, and when Nelson rotates his wheat with alfalfa, it is not only providing a break in the pest cycle and some above and below ground diversity, it is also a high carbon mulch for the base of his frambuesas, an erosion inhibitor for uncovered soil, and a cultural centerpiece in the form of wheat flour. 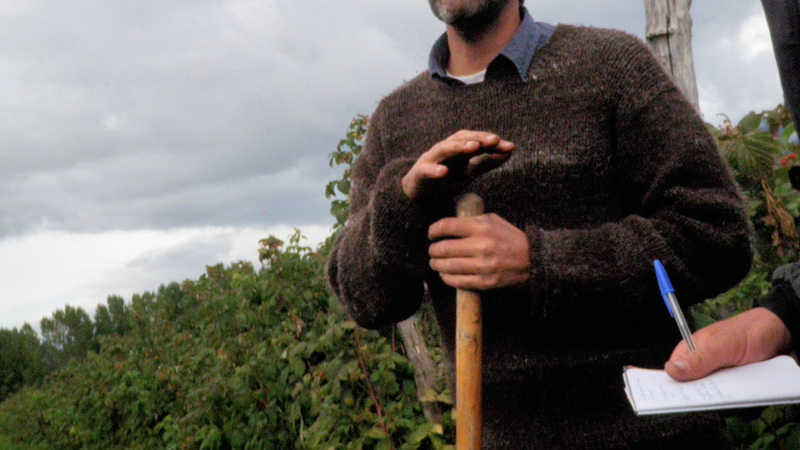 He also relies heavily on the Biodynamic calendar, and does not stray from the dates laid out annually for planting, harvesting, and other generic farm tasks. Nelson also gave us a couple other tips for raspberry production. 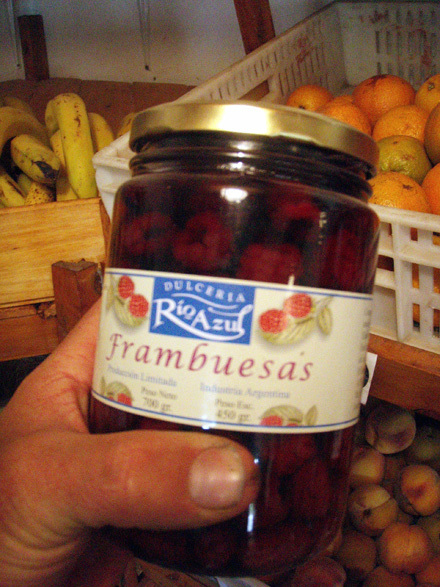 He cultivates two types of frambuesas: Tulamín and Autumn Bliss. The first variety flowers once a season, and the second flowers twice a season. When a freeze is in the forecast, Nelson sprays his frambuesas with water, the ice that forms serves as a protective barrier from the frost, only to melt the next day. This helps insure that four months of the year he can employ the fifteen workers that harvest every day. He claims “there must be 4 centimeters between the fruiting bodies on each plant for maximum productivity;” and, with a careful eye observes every plant to make sure this is the case. So, where does the fruit go? The fruit operation at Piedra Pintada provides economically for the Castrillo family, and enables Nelson to focus on his true passion, growing vegetables. In order to reach his financial goals he sells most of his fruit preserved in the form of a value-added product. This maximizes his profit as well as the farm’s economic viability, a crucial ingredient to the sustainability triangle. Thank you Stockholm Conference! Nelson is also focused on future generations and, for seventeen years now, has been involved with the semilla banco, or local seed bank! The seed bank is down the road from his farm in a well-chosen area to prevent unwanted fertilization. A key aspect to seed saving is preventing your plants from being fertilized by another species of plant with a similar reproductive cycle, or by other plants of the same species, that may not have desirable traits that you are looking for in the next generation. This is why the geography of a seed-saving farm or plot of land, can be very crucial to its success. He, as well as many other local farmers, contribute seeds and grow plants for seed saving exclusively. Nelson says, “its for the genetic diversity and food security of our area.” This is what the world needs to be doing!  Start small, save seeds, and begin contributing to a movement that is ancient, a movement that will actually create food security. This is beyond a Siberian seed vault hidden under concrete, rebar, and Steele with monocrop genetics owned by Syngentia and Monsanto. This is grassroots, and as Vendana Shiva said, “seeds are our Mother.” Would you put your mother in a Siberian vault deep in the ground? It is time to rethink global food security, one seed at a time. As we walked down the last row of frambuesas, and my fingers were almost to sticky to take notes, I remembered what a “hands-on” experience was, and began feeling sorry for whoever would be reading these words; knowing they could only taste the delicate sugars and feel the advanced fractal structure of the raspberry through my words. Believe me, they were as good as they sound. The truth is, none of this would exist, as well as many other farms just like it, without the vision and commitment of the farmer. Nelson believes in organics, and lives it. 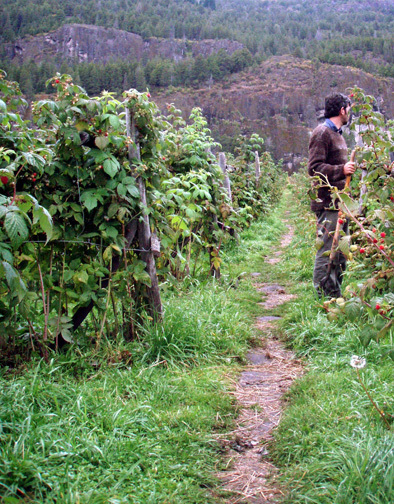 He believes that, “with transparency and integrity, there is no need for a certification, it avoids the bureaucracy anyway,” and with approximately 25% of Argentina growing organic and only 5% of that being certified, it seems other growers feel the same way. Nelson claims, “the government does not even help out, or care about this type of small agriculture.” In that case, it is up to the transparency and accountability of the local farm and the keen eye of the community. 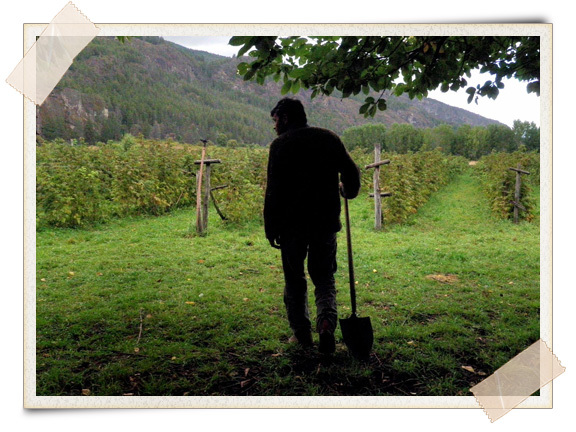 Only then will the farmer develop true integrity, and everyone can rely on a wholesome and safe food product. You see there really isn’t a need for more white coats, clipboards, thermometers, and brainwashed inspectors in small-scale agriculture. It is time to put the word holistic back into food security, even if it is one seed, one plant, and one person at a time. This is grassroots, it’s time to grow! Great article Asher and as I am particularly partial to raspberries I am quite envious. Nelson Castrilla sounds like a true man of the soil and has a wonderful connection to nature. The fertilizer he makes sounds very interesting. Thank you for bringing these articles to us.